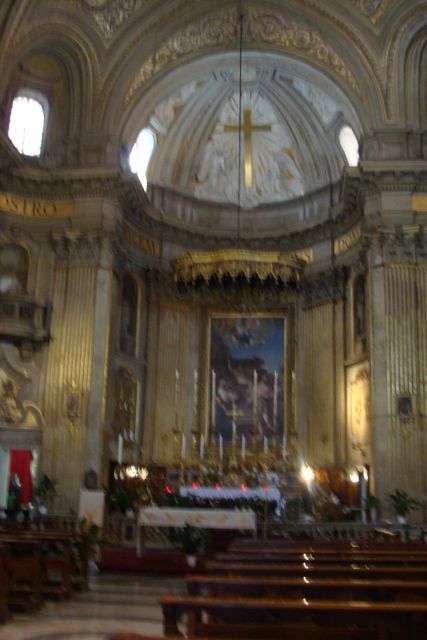 Thursday is the last day of the conference and it concludes with a concelebrated mass at All Saints C of E near the Spanish Steps. A choir from Durham, England is in residence, so our mass has beauty of song, as well as word and sacrament. It's both lovely and sad, having made new friends, it is difficult to part with them. Following the mass, Lizette and I go and have lunch somewhere along Santa Croce. And then we part ways. I have writing and shopping to do, as does she. 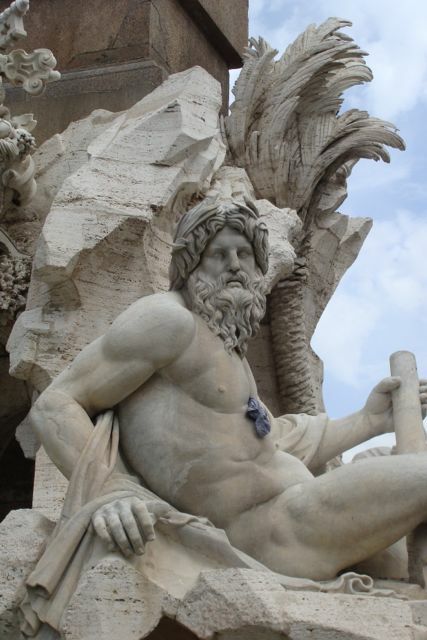 We agree to meet the next day at Piazza Navona. And so we do at a café near the Neptune group. We have coffee and talk about the Society and its role in the church. 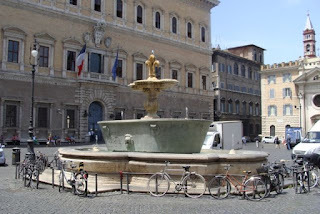 We also talk about Navona, and the wonderful shops that surround it. 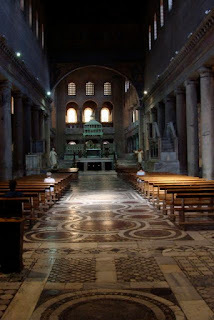 We decide to go to see the Basilica of Saint Laurence outside the Walls. This means that we have to navigate getting there, which involves a bus trip to Termini, and then by foot to the church, which I remember as being close. It is not, but on the way we pass Porto Maggiore, and the remains of its aqueduct and ancillary buildings. Nearby is Santa Croce in Jerusalem, but we resist the temptation, and wend our way to San Lorenzo. Finally I do something I never do. I ask directions from a passing priest, and he supplies them, sort of. It's still some distance, because, unknown to us, we are not taking the hypotenuse of the triangle. When we get there it's closed. So its off to lunch in a little restaurant that Barton and I visited in 1989. So it's the cemetery that we will do. We wander around and fine wonderful things, such as the Cappuchin tower that marks the spot of their cenotaph and chapel. I had always thought that it was Fransiscan, and empty. Now it appears to be finished and honoring another order. Most of the tombs are Nineteenth Century, and are of a similar nature, but some really stand out. Here, not in the city itself, I can find Secessionist buildings, such as in the picture to the left. This had almost a Mayan effect, others were more brutal, or highly ornamented in a stylized way. Soon our hours pass and its time for Saint Laurence, so we go next door. 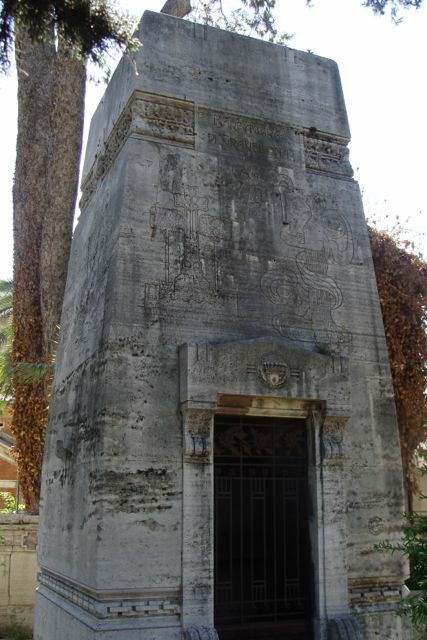 The purpose of the cemetery is, Lizette thinks, to be buried in proximity of the saint. The church is surrounded by the cemetery, and the church is cut into the hill upon which the cemetery is located. 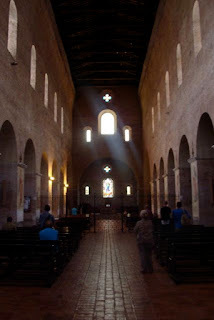 It's a delight to see this fourth century church, magnificent in its simplicity. 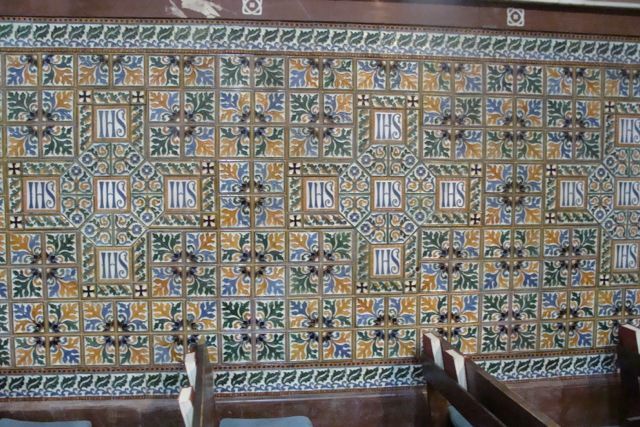 There have been some restorations and changes, but not to the extent that we witnessed at Saints Peter and Paul. Here one gets the effect that early Christian pilgrims would have experienced. 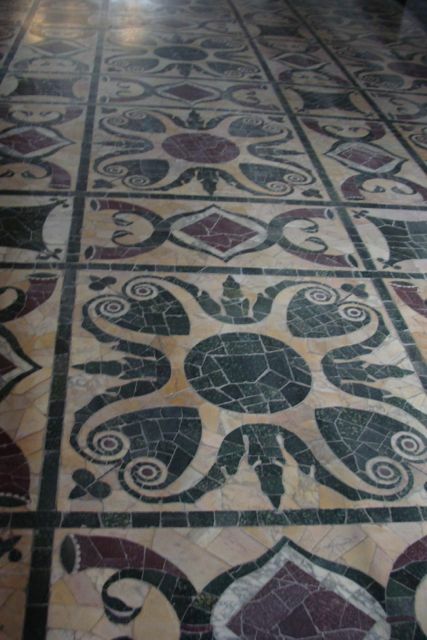 There is wonderful inlay both in the floors, but also in the Paschal Candlestand, the Ambo, and the Pulpit. Beautiful! 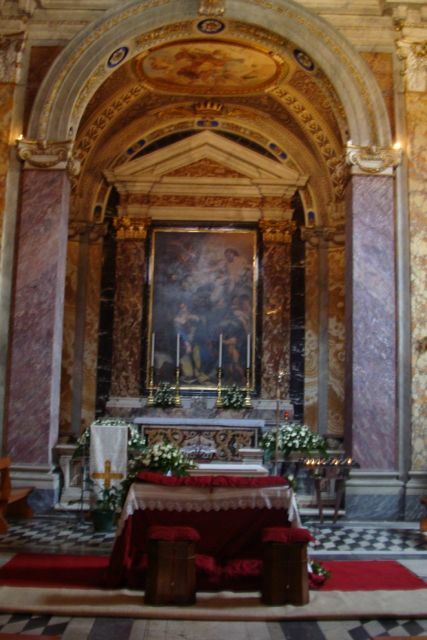 I especially like the ciborium over the altar. We go down to the crypt, but most of it is gated and locked. Lizette tries each one, but to no avail. The portico is painted with the life of the saint, and there are several pagan and Christianized sarcophagi both inside and out. We linger and linger - it is a magical place. Finally it is time to go. 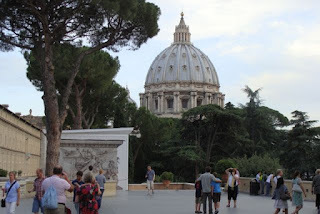 We grab a bus into Rome, hoping to get to Santa Maria Maggiore before it closes. I make a mistake and we get off too early, so we stop for a drink and walk the rest of the "Processional Way". It is closed when we get there, but Lizette has two more days here. I notice up beyond the baroque porch a mosaic that I had never seen before. It is quite beautiful. We decide to part ways. I am really tired, and Lizette needs her time as well. It has been a very special thing to spend a day with her, especially in this context. 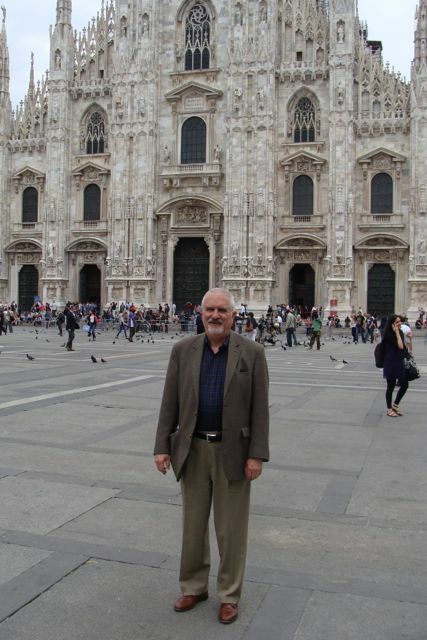 I take a cab back to Campo fiori, and go to the hotel to rest and to write. At nine I go out to have dinner: amuse bouche of lentils, and a separate plate of olives and mozzarella in cream, carciofi alla romana, timbale con fungi, angel, and fruita di bosco con gelato. I go back to pack and to rest. Tomorrow is home! It's the American's turn to celebrate Mass, so Lizette presides, I serve as deacon, and John and Barry read and serve at the communion. 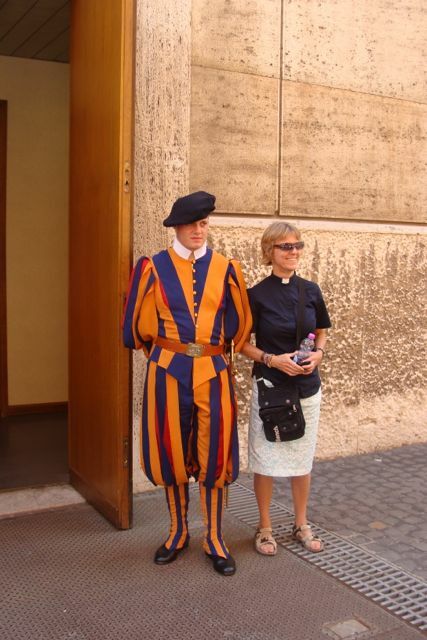 To do this I had to lug my alb and stole across town, but got to walk across Rome in my cassock. We have to queue up for the audience, and it was somewhat like boarding a LOT flight - every man for himself. We were led to believe the Audience was particular, but now it is general but at least in doors. It is very hot. The one bishop present is soon whisked away to sit in the front row. We are several seats back but toward the front of the hall. 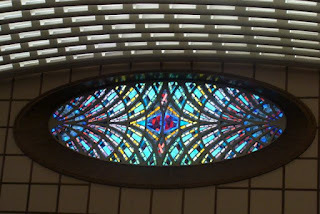 The "new" audience hall was built by Paul VI, and the architect, I believe, was Pier Paolo Nervi (who was consulting architect on St. Mary's Cathedral in San Francisco). The hall is huge, seating several thousand people, and at the same time its monumentality becomes almost home-like and intimate. Right across from us are pilgrims from Vera Cruz, Mexico - they are all done up and have a band. They are a big hit. We sit there for a good 45 minutes waiting for the audience to begin, as various groups get up and treat us to music, bands, choirs, small orchestras. There is an excitement in the air. Finally, an "organ" sounds, large doors open and in walks the Pope accompanied by Masters of Ceremony, assistants, monsignor, and assorted bishops. I must say, I was overwhelmed. 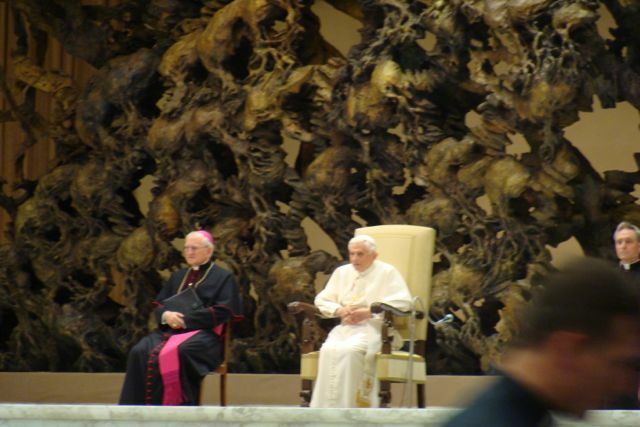 Although I find some, if not many of this Pope's policies to be difficult and downright wrong, the enthusiasm of the room sweeps me off my feet. His greeting to the "clergy men from Southwark Diocese" (they couldn't bring themselves to say The Society of Catholic Priests) is heartfelt, and blessings are offered. The women in are group are amused to be called "clergymen." This is an aspect of the Roman Church that all outside of her seem unable to make happen - the embrace of a large segment of the world. Several language groups are greeted, mentioned, blessed with a little homily and prayer. It is as overwhelming as is the room itself. Afterwards we retreat back to our neighborhood, just a block away, and have a very bad lunch at a local bar. I cab back to my hotel and get rid of alb and cassock. Later in the afternoon we board a bus and go to the palazzo dori pamphilli where the Anglican Center is located. The director and his wife graciously greet our group and regale us with "nibbles" and drinks. It is very enjoyable. 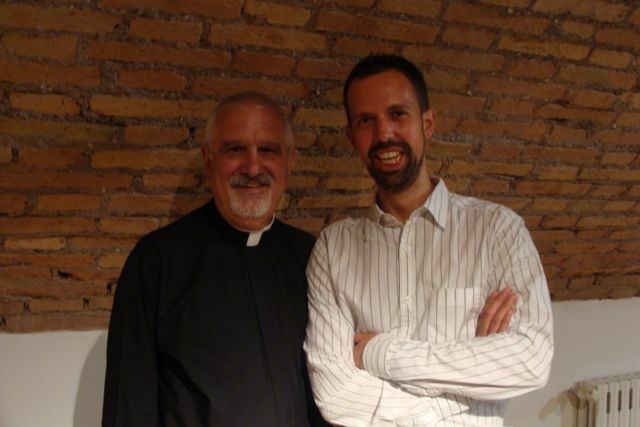 The director is also the Archbishop of Canterbury's personal representative to the Holy See. Thus David has a very interesting perspective. Earlier in the day, the director of the Anglican Desk at the Vatican filled us in on ecumenical "progress", such as it is. 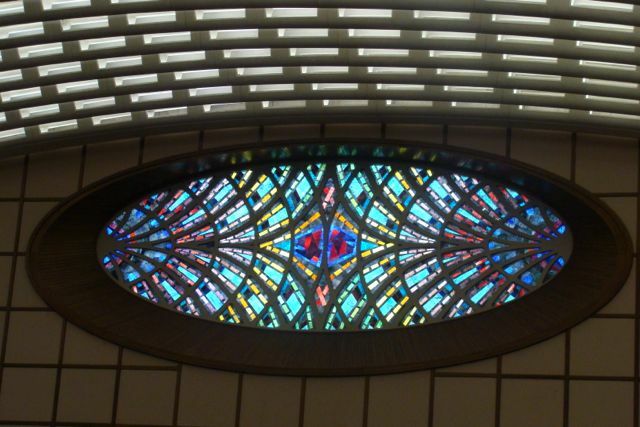 It seems that the ordination of women, and the consecration of Gene Robinson has halted any substantial progress, however new talks are slated to begin. For me it's a glimpse into a new world that surrounds the larger question of what it means to be catholic. It is good to be in a community that takes the topic seriously. Earlier in the day, Louis, a priest from Essex, invited me to dinner, and so we leave the reception and have a lovely dinner in the warren of streets west of piazza Navonna. It is quiet, there are trees and stars, and the menu is quite good. We talk about what it means to be gay, to be priests, and to be in relationships with understanding and wonderful men. I have made a new friend. 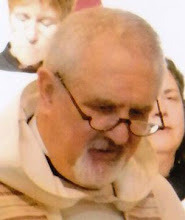 Later I realize that it is the 41st anniversary of my ordination. How perfect! 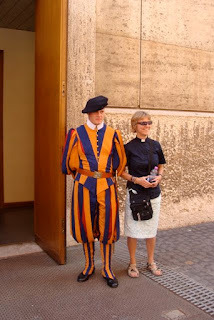 With the rising of the Monday sun, I spend some time writing, because I shall have to troop over to the Vatican, or near it for the conference. 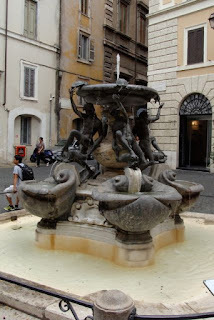 I grab a late breakfast, or an early lunch and make my way across the Ponte Sisto, and walk up the Trastevere side up to the Burgo Santo Spiritu, aside the Bernini columns and to the Residenza, where the conference will be held. It's a slow start and my introverted side is in full gallop. Slowly I meet fellow priests from the UK, North America and from Australia. There is small talk and water out on the terrace. The sessions begin at three and there is a wonderful series of Bible Studies on Paul and Romans by Dr. Paula Gooder. She has a unique perspective and I shall want to read more of her work. After Evening Prayer all 90 of troop over to a small restaurant across the street, where the food is quite good, and the conversation difficult due to noise. After desert I make my good-byes and walk back to Campo. On Tuesday we begin the day with Eucharist, celebrated by the Autralians. 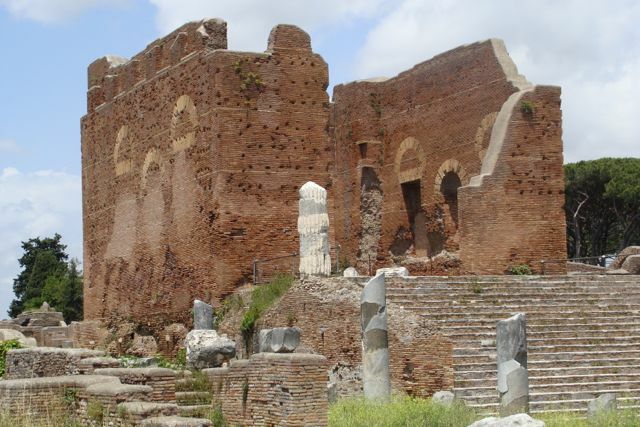 That is followed by more Bible Study, however, the main event of the day is a trip to Ostia antic, the ancient port city of Rome. I took Anna there in 2000, and was anxious to go back. Many call it Pompeii in a part - it's so lush around the ruins. We take a bus by the airport and then to the site. It is a lot of walking, but such delights to see, especially if you are into ruins (which I totally am). 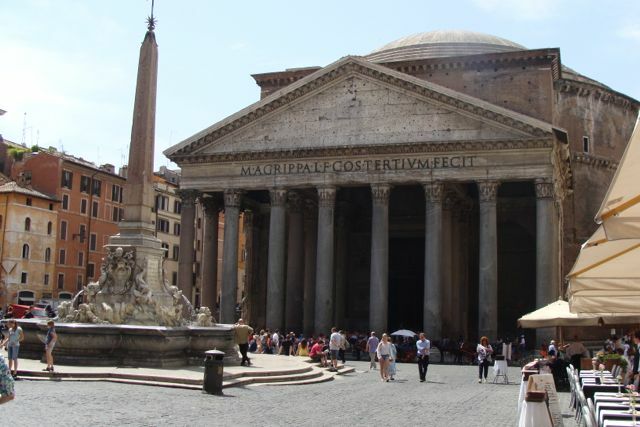 The capitol, above is wonderful, and across the corso is the forum with wonderful temples and baths. There is a stop for lunch and drinks (it is very hot). When we see the interior workings of the heated rooms at the baths, see the picture to the right, I am reminded of a comment I heard from an American woman on the Palatine the other day. "The were really a horrible people," she said, but I guess that they did have their inventive side." What a simplistic view of this culture that was laid out before us today. Marvelous buildings, warehouses, offices, tenements, bakeries, plumbing and theaters all spoke to a vibrant and diverse culture. A horrible people, indeed! 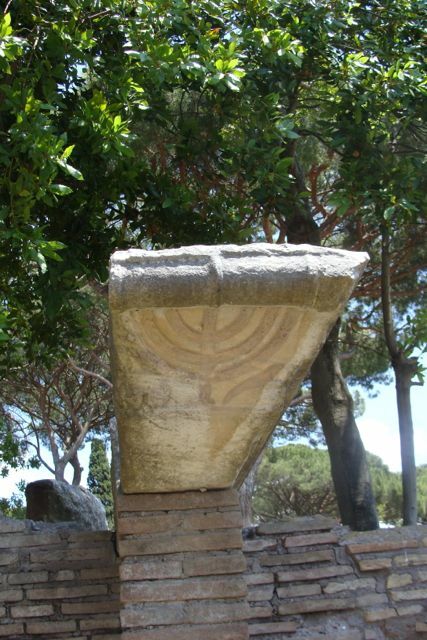 We walk past a Jewish synagogue, a Mithraum, and more temples than you can shake a stick at. 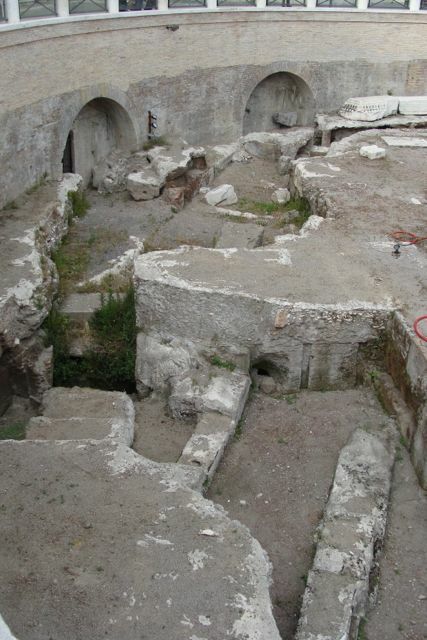 There is one nymphaeum that was turned into a Christian church at one point. Such a jam of institutions. 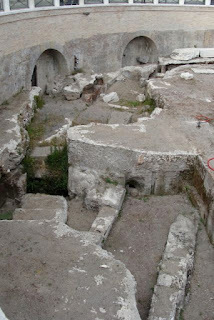 50,000 people lived here, managing the traffic of trade that entered and left ancient Rome. 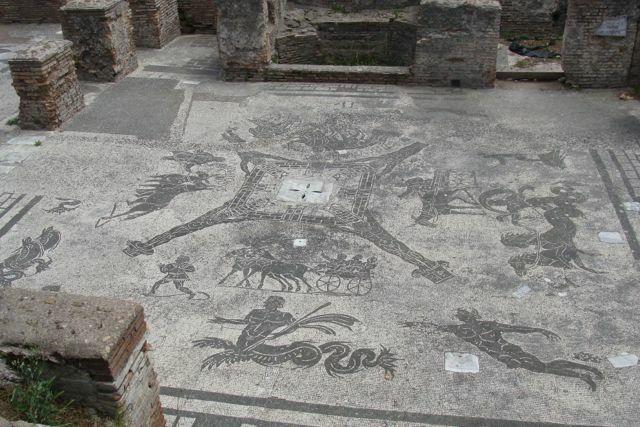 My fellow tourists are surprised by the mosaics, which are all black stone set into white. The example from another set of baths is pictured below, but in the office area of the port, there was a mosaic in front of each office which indicated the enterprise inside. We make our way back to the buses. There is more to see back in Rome. 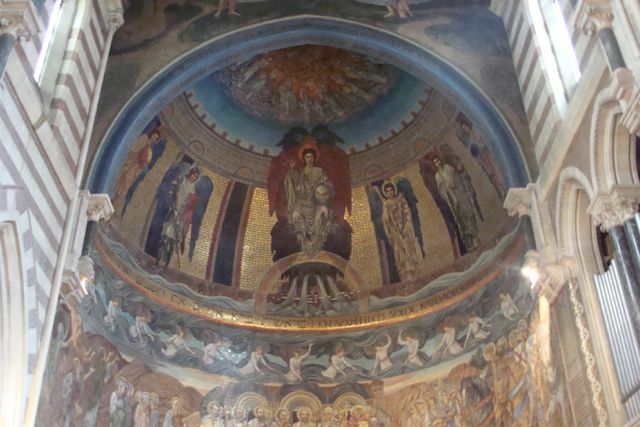 As we enter Rome we go to visit the Abbey of Tre Fontone. This is a cult site centered on the execution of St. Paul, and consists of three Churches, on abbatial where the monks (Trappists) are singing evening prayer, and one the site of imprisonment (what happened to the Mamartine?) and the third the site of the execution (the head bounced three times). 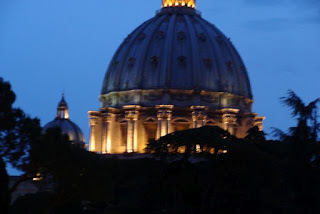 My camera has used up all its juice, so I am left camera-less at St. Peter's and Paul's outside the Walls. Decimated by a huge fire in the latter part of the Nineteenth Century, it was rebuilt, and is a shadow of its ancient self. The new church is overblown, although there are a couple of interesting features, the ciborium over the altar, and the paschal candle stand, which both seemed to have survived the fire (although Lizette and I are not certain about the ciborium). 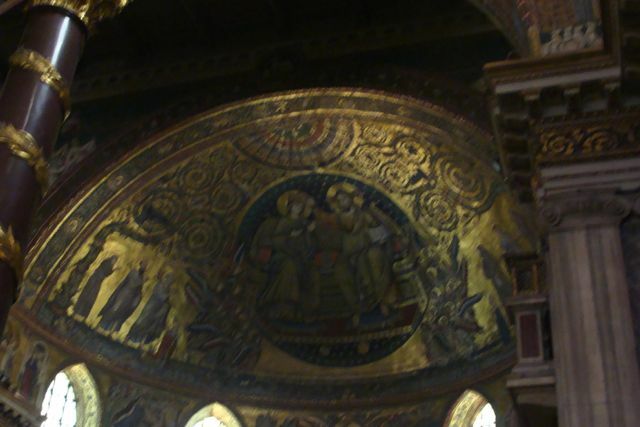 There is an "ecumenical" Evensong with the Benedictines, although we don't get to meet them. It is accompanied by a wheezing organ that needs a great deal of love. Upon return, Lizette and I decide to walk to Trastevere to have dinner. It's a long walk, but there is a delightful conversation. Along the way we pass St. Egidio Church which was home to the St. Egidio Community. Started as a protest to the closure of their church, the people of this parish began lay-led services coupled with a social outreach (feeding programs, pro bono legal work, and the like). The group is now so large that they meet for Evening Prayer at Santa Maria in Trastevere. We go in for the last few moments of their praying, and the church is packed. I don't remember what I had for dinner, but I do remember a rich conversation, and a side conversation with some young people from Chile, who were studying in Germany. Lizette shared our half bottle of wine with them. I put Lizette into a cab, and I walked across the Ponte Sisto to return home. What a day. 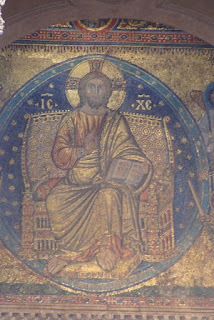 It's Sunday and after looking at the website for All Saint's Church (C of E) and St. Paul's inside the Walls (Episcopal) I decide on the later. 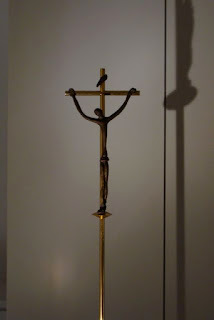 Unfortunately, The Bishop for Europe has gathered all the rectors in some schloß in München, and has asked that all the parishes have lay-led liturgies. That means that there is no Eucharist this morning, and I am disappointed. We read through Morning Prayer, and after it is over I meet other clergy who are attending the SCP conference. The building, built by J.P. Morgan with major decorations by Edward Burne-Jones, a pre-Raphaelite favorite of mine, is quite lovely. The apse and the double arches that stand in front of it are filled with mosaic of his design. They are profound, colorful, and awe-inspiring. 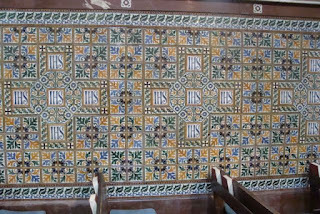 The picture on the right shows the tile work that faces the walls of the nave - quite lovely. The organ isn't bad and they have an ambitious choir and music program. One member did tell me, however, that they are tired of Vivaldi (The Four Seasons) but the tourists love it. 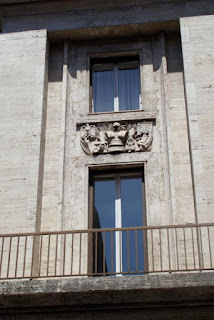 My goal is the museum at Palazzo Barberini, and on my way there I notice a Mussolini building next door. Three window panel each depict a separate aspect of Rome: Justice, Fascism, and the Church. 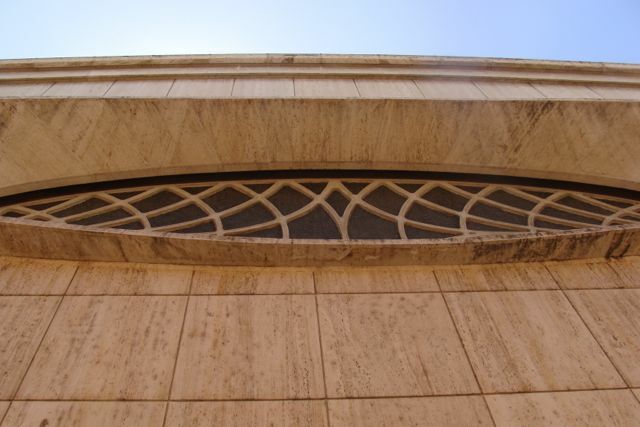 You can see the one depicted as a panel between the two windows that are over the main entrance to the building. I like the lines, and the statements are unambiguous, if not arrogant. Interesting, though. I go into the palazzo. Only three rooms are open to the public - "Staff shortage". I decline, and continue up to the Spanish Steps, making a sharp left right before the steps and descend the piazza next to the Spanish Steps. There is the restaurant alla Rampa, a favorite of mine that I visit every time I am here. Lunch is vitello tonnato, risotto con fungi, and a panna cotta alla arancia. It was excellent. From there I wander home, still a bit tired from my excursion to the Forum and the Palatine Hill. My feet are feeling it. I find this little church (little only in Rome) dedicated to the Virgin, where the nuns are singing Evensong. It is delightful hearing them voice the office and psalter. I sit for a few minutes and drink it all in. In time I get up and go to my hotel, and collapse. Tomorrow will be a busy day. I am finally learning my way around this quarter, but every once in a while something jumps out at you - like this fountain. Recognize it? A copy of this fountain sits in Huntington Park right across from Grace Cathedral. It knocked my socks off. There are some minor differences, but it is mostly all there. I slept in late. I think that I work hard when I travel, and forget the toll that it takes. Once I get on my way past the fountain is see an open church door - a church dedicated to the Theotokos. It is quite lovely, and has a program of decoration that is developed around all of the aspects of the life and status of the Virgin. 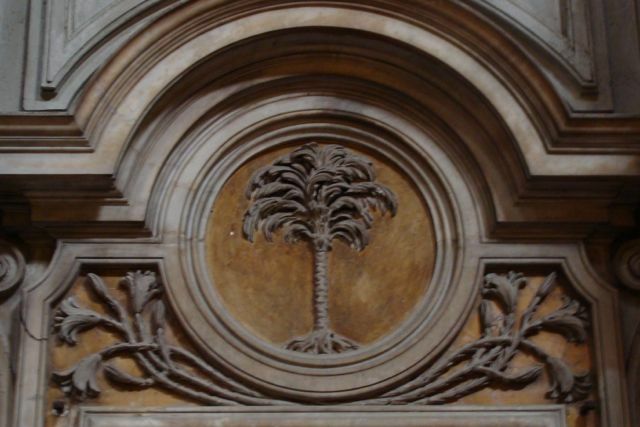 Here is a door spandrel filled with a Tree of Life, planted by the living water (placed over the baptistery). i sat for a bit to take it all in. Sometimes there's too much and your mind misses things. Better to wait a bit. So I did. On my way to the Forum I have a bit of any early lunch at a Pizzeria that Barton and I visited some 23 years ago now. The outdoor eating area was once covered with netting, but vines have now covered that over, making the place quite pleasant. The crowds at the Forum are minimal, and I am grateful. I'm going to be selective in my viewing. I go to the curia and am delighted to find that changes have been made. No longer a big, empty room, the floor has been restored, and there is a temporary exhibition of Roman glass. There are explanations as to the history of the building/room, and its construction and reconstruction over time. Once used as a church (what wasn't) you can still see traces. What excited me, however, is the recovery of the platform on which the praeses sat, along with the base of the statue of Victory that had been placed there. 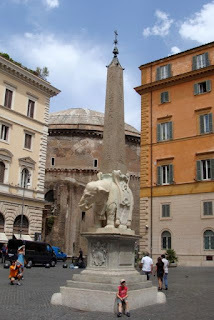 There is also a huge porphyry statue, thought to be Trajan, that was found behind the curia. They will be uncovering stuff here for centuries. The road that divides the forum traiano has been blocked off, and will, I suspect, be carefully removed to uncover the history that lies beneath. 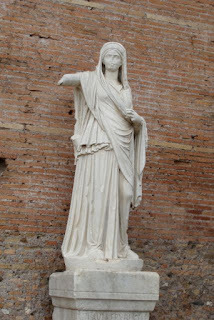 I walk over to the house of the Vestal Virgins. It is quiet in the atrium, lined with the cellar of the women who lived there, and lined also, on one side with the remains of statues of the virgins who kept the flame alive in the past. 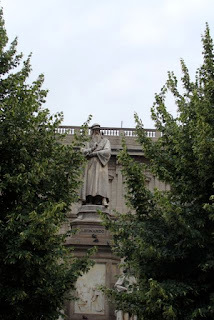 Only two of the statues had faces, and I wanted to look at them; to see who it was that lived here, who it was that tended these gardens and devoted their lives to the community hearth. In the Vth Century the Emperor Theodosius ordered that the whole complex be abandoned - a centuries old community sent on their way. I imagined the scene. On the northern end of the atrium they have uncovered, under two other buildings what they think was the original building dedicated to these women and the hearth. Layers upon layers reveal the human experience here, and the need for a hearth. 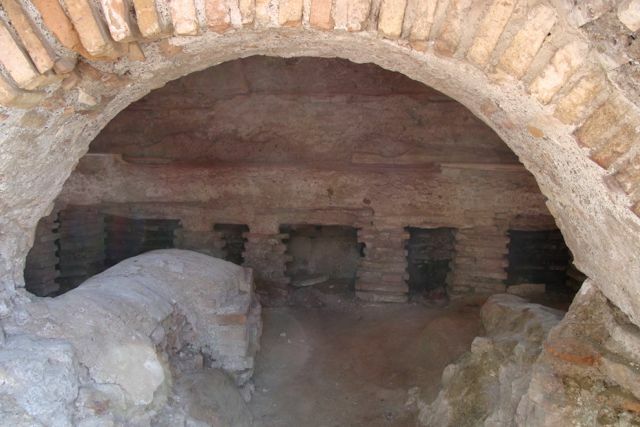 As I make my way up to the Palatine, I return to the Neronian cryptoportus, a long underground tunnel that connected parts of the ancient palace that stood there. 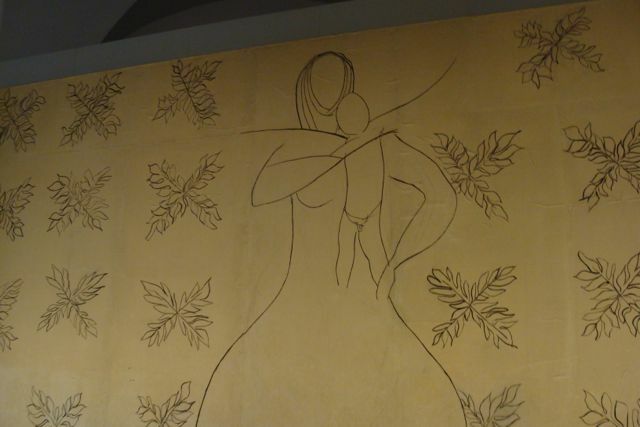 What is fascinating are the stucco decorations that still exist there. I wonder if there is a finger-print. Livia's house in closed. Augustus' house is closed - pericolo! The domus grifoni which I visited in 2009 is closed. I see the door where it is - nondescript and unmarked. I wonder how many other doors there are where treasures can be seen. The Flavian Palace is overwhelming, and much of it is closed as well, so I walk down the path that will eventually get me to the exit. Along the way, however I see some really beautiful and interesting things. 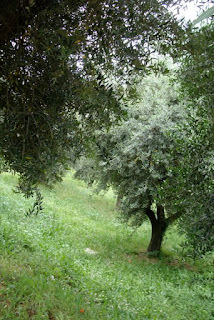 On the hill that descends down tower the circa massimo there is a large stand of olive trees. As you move along you can glimpse the Colosseum off in the distance, but to all intents and purposed, deep in the midst of Rome, you are in the Latin countryside. Beautiful. 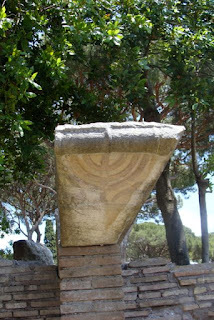 There is a rock yard that once was a magnificent temple built by the Emperor Elagabalus. Nothing is left of it other than the foundations. As I walk toward the east I come upon a vista that towers over the Arch of Constantine, the site of the Colossus that stood to its east and gave the Colosseum its name, the Colosseum itself, and the hills with the domus aura beyond. There is a covered area, and below it are ruins recently uncovered. 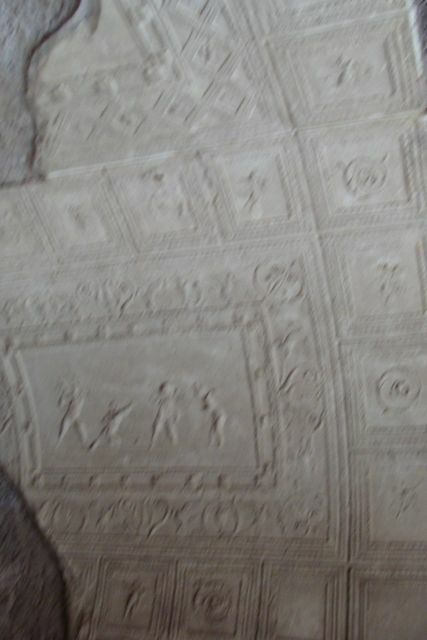 Suetonius writes about a "revolving" dining room that the Emperor Nero had built. Most thought that it was an exaggeration. Here, however, seems to be the foundations for a circular room, below which was machinery and structures that may have supported such a room. Fascinating. I am thirsty beyond belief, but I trudge on wanting to see, finally, the back-to-back temples dedicated to Roma and Venus. 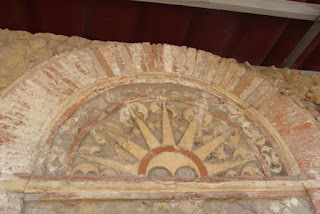 Originally a blank wall separated to the two cellar that held the cult figures of the two goddesses. Later, two apses were built back to back, as seen in the picture to the left. Only a small fragment remains of the Roma figure, and a great deal of her temple was encroached upon by a church. Thirst over takes me, and I go to one of those tourist places by the metro. It's a coke and a hot dog. Sugar, salt, fat, and water - oh, and some carbonation as well - it's all that I needed at that point. Even though I have been selective, I've spent a great deal of time in the forum, and I begin to wend my way back to the hotel. I need more water and have a granita limone as well. I sit and savor both. I spend a little time at the Trajan complex. 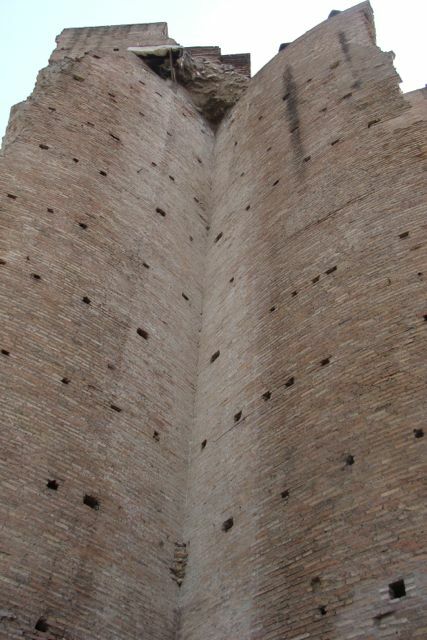 By the Trajan Column, you can see the puzzle that the archaeologists have to deal with here (and everywhere, really). There are buildings upon buildings. You can see the foundation stones that sit below the foundations of the buildings that surrounded the column. What a wonder it is for those who uncover and decipher this stuff. I'm exhausted. No supper, just writing and bed. 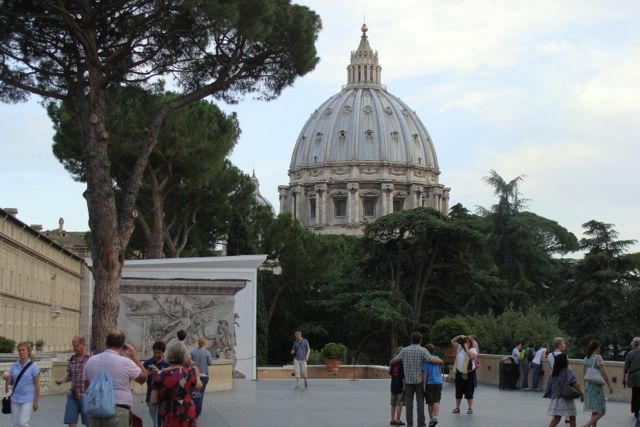 After my siesta, I get up and get ready for an evening visit to the Musei vaticani. On Friday evenings, they open it up from 7 to 11. It's still crowded, but not as much. Last time I went with my daughter, Anna, we got our tickets and got inside and Anna indicated that she wanted to sit down and talk first. So we did. "Dad," she said slowly and deliberately, "I don't do museums with anybody!" "Great," I replied, "I'll see you back here at 4:30." And that's the way it was. Even if Arthur had been here, we would have made the same arrangement. I cross the Tiber at Ponte Sisto, and walk over to Trastevere, but continue my trip on the bank of the Tiber. Somewhere along here, Queen Christina of Sweden lived after she abdicated her throne, and renounced her Lutheran ways. I wonder what she would think now? I am going this way because on Monday, I have to navigate over to the Residence where our meetings are being held. This walk, however, still does not give me the picture. There are these hills, you see, just south of the Vatican (itself a hill) and that complicates things. I walk across the great square by Bernini, all cleaned up on the south side and being cleaned on the north. It is marred a bit by huge television screens. It is heartening to realize that they realize that the space is for the Word. Still... Once I've wended my way to the entrance to the museums, I stand in line, and unfurl my on-line receipt. The woman next to me kindly informs me that because I got tickets on-line, I have priority entrance, so I move to a much shorter line. Truly these museums are a mirror of the world, from the works from New Guinea, that line the unique spiral that takes you to the museums from the lower entrance, to the ancient works that I do take some time with. Normally, I would have spent a great deal of time with the Egyptian collection, but I've seen this before, and just saw the materials in Berlin in the Fall, so I fly over to the Roman things. 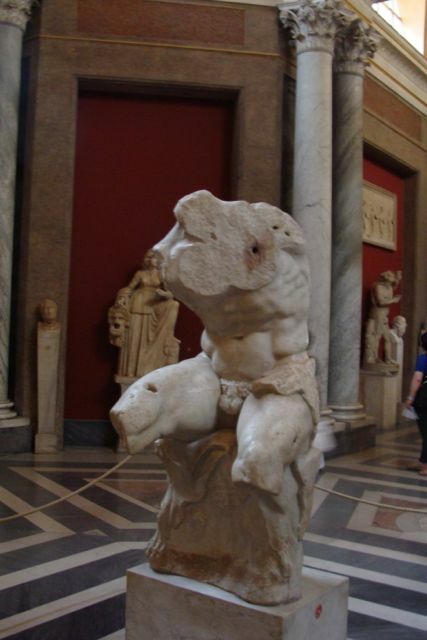 The power of this torso is just amazing to me even, or perhaps because of its present state. It dominates the room. Apollo Belvedere is being worked on, and was not available for viewing. Schade. My memory of these museums is dominated by the ceilings. 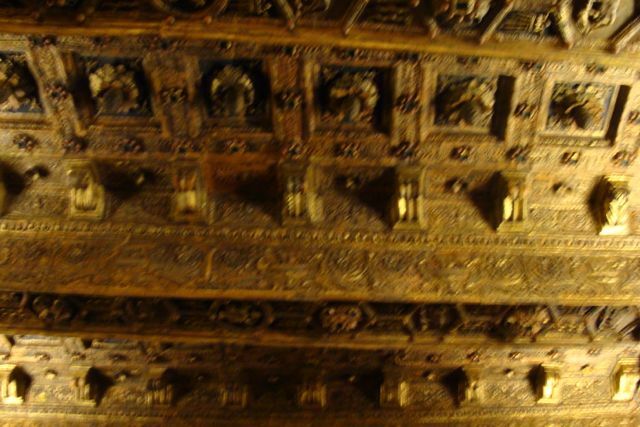 There is the magnificence of the Rafael ceilings, but this time I am taken especially by the ceiling of the long hallway that forms the Gallery of the Maps. It is golden in the evening light, and many are not looking at the maps at all, but are photographing or just staring at its beauty. The maps themselves are interesting, especially a map that was done up to show all the Etruscan sites, known at the time, along with their place names. It was fascinating. It's also interesting to see what the cartography of the time was like, especially with sites known to me - the cities of Italy, and how they were depicted then. You'll notice in the photograph that the windows are open. 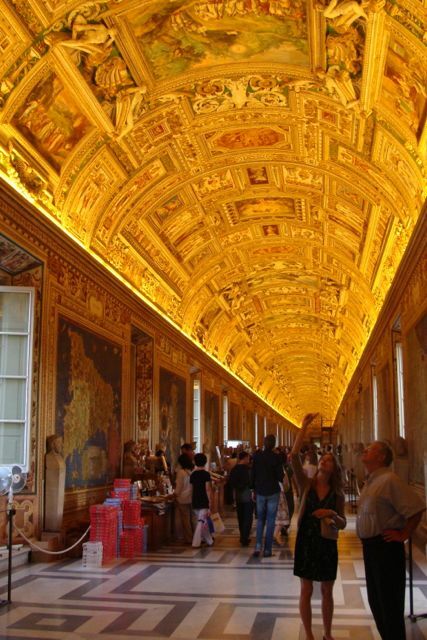 This is not seen much in other museums, but here one could be gazing at the golden heavens, or looking at the blue-green of the maps, or gaze outside to the Vatican Gardens, cypress with its special green and the deepening blue of the skies. (To myself the other day: "I can't believe I'm watching this horrible Borgia series on television!") But I did, and so I take special notice of the Borgia apartments. Not a sumptuous as I would have thought, but the ceilings are magnificent. Unlike the Gallery of the Maps ceiling where you wonder, "How in the world did they do that?! ", in the Borgia apartments you see exactly how they did that. The placement of the wood, the carving, the cross pieces that actually bear a load - it's all very human. I suspect Alexander VI would not have been happy with that observation. Yes, I saw all of the Rafael, and took photos as well. What I really want to comment on is the contemporary collection which everyone blows off, quickly passing by to hurry their way to the Sistine Chapel. Another photographer and I agreed that they didn't know what they were missing. Perhaps they don't know these artists. I hope you will permit me a few photographs of works that stood out for me. I didn't remember this collection as being as extensive as it is. Here you can see Otto Dix, Emile Nolde, Botero, Sutherland, Dali, Bacon, Braque, Epstein, Barlach, Le Corbusier, Münch, Stein, Burchfield, Orozco, and many others. I expected some Manzu, since he did the doors to the basilica, but he was not in the exhibited collection. Here is the stoning of St. Stephen by Orozco. What fascinated me by these works was whether these gifts were a reflection of personal faith or not. Were they political, might the Orozco have a sub theme here? Or were they somehow a reflection of their own journey of faith and life. Given that task, I find that these works are a delightful read, and heartening in their insights. Like religious music, there are so many levels here. I am a real fan of Francis Bacon and his compatriot Lucien Freud. 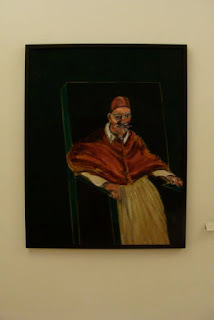 I was delighted to find a study by Bacon for his rather irreverent series on Innocent X and the portrait by Velasquez. Here it is before it is shredded, stretched, and scratched in the further paintings in this series. It is almost calm, as if waiting but not realizing the violence that was to follow. Did Bacon give this to the Papacy, or did the collection acquire it. I wonder. If Bacon gave it, I wonder why? Was it a poke in the eye, or a homage? 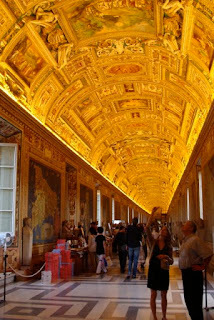 From this collection I went upstairs to the Sistine Chapel, crowded, noisy (shushed from moment to moment), one really wants to lie down of the floor to take it all in. But you can't. I realized this conundrum about life once at Salisbury Cathedral. A friend and I wanted to know the best place to sit so that we might be able to take in all the beauty of the processional liturgy. It was plain to us. We simply couldn't, and having made that realization, enjoyed and savored what we could. So it was here. I had forgotten, or like most people probably never saw the series of paintings below the Michelangelo that were done by Botticelli. They are interesting, but really have a different plan about them. They are static in comparison with the sweep of the Michelangelo. In Florence, the last time, at the Uffizi, I realized that I really don't like the "fuzziness" of Botticelli. I don't hate his work, it's just that he doesn't have that much to say to me anymore. 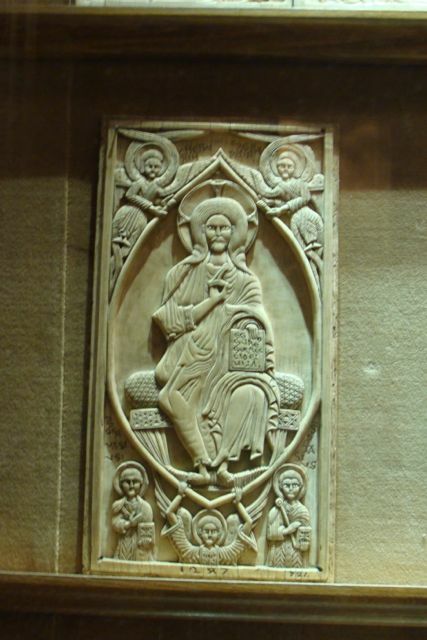 I love ivories, and especially Byzantine ones. They were so influential in the Carolingian and Merovingian eras - making statements, although subtle, about the pretensions of these families. Thus reflected back to us are an image of Rome long in decline but still influencing the developing nation states of Europe. A fascinating book to read in this regard is Chris Wickham's The Inheritance of Rome - Illuminating the Dark Ages, 400 - 1000. It is that influence that overwhelms me every time that I come to Rome. Their law, their religion (before Christianity), their artistic forms (both their own and those modified, or taken from the Greeks), and their virtues and their vices all flow down to us. Now if we only understood, and explored that reality. Meanwhile, back at the ivories, isn't this beautiful - the precision of the carving, the color, the softness of the light. I found this collection to be very engaging, along with Medieval metal craft, and glass work. The day has faded, and in the night light, the gardens and the palaces take on a different light. I sit for a time, just resting, in the Cortile della Pigna. Many others are well, some having a buffet offered the right of the "pigna". I go back in and attempt a revisit of some galleries, but I have given this four-hour window it's best. My feet are killing me, and all I want at this point is dinner. 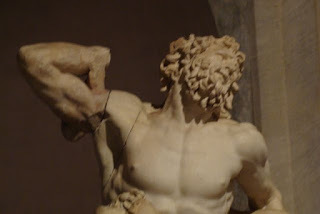 I am feeling a bit like what the following photo suggests, a stretching Laocoön, minus the snakes and threatened sons. I walk over to the Tiber and cross on the Ponte Vittorio Emmanuele, and immediately get lost on the other side. The fun of getting lost is that you see things and know relationships that you can use later. 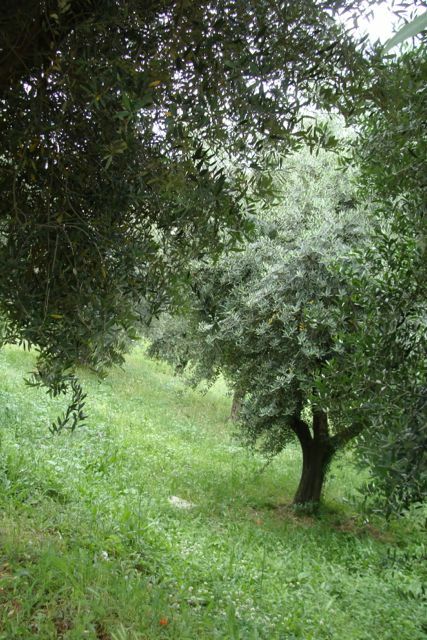 I find a not-so-crowded restaurant and have a delightful meal of Caprese, filleto al peppe verde, and baba con fragile. Italian waiters are a riot. They ranged this evening, from dismissive, to highly attentive (when I indicated that I liked the food - even the chef came out) to forgetful, especially when women were nearby, and finally almost weeping as I left. Wonderful! They didn't bring me breakfast this morning, so I do some email, write a little bit, talk with Anna via Skype, and then get ready for the day. Since they didn't bring me breakfast, I tramp over to Piazza Navona to spend some time with my buddy, Bellini. The fountain of the four rivers has to be one of my favorite pieces of sculpture. Each of the rivers, the Nile, the Ganges, la Plata, and the Danube, represent some of the continents. My favorite is the Nile, whose face is hidden since the source of the Nile is unknown. I take my time enjoying them and one of my favorite Baroque features, the slightly off kilter arms of Alexander VII. 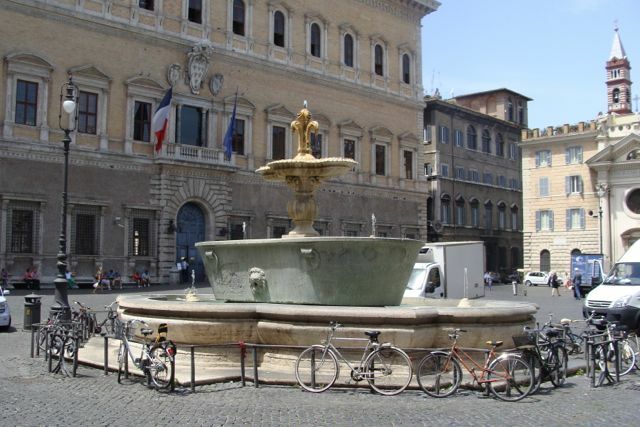 It is time to have something to eat, so I go the northwest corner of the Piazza where it is relatively quiet and order a spremuta di arancia, uno cornet to, e café macchiato. Then I sat back and watched people, and I watched the police watch people, and then watched all the "merchants" in the piazza watch the police. Wonderful. Time to move on. I have an errand to perform, actually several. The first is to start to find the gallery where I purchased some Salviati glass 22 years ago. 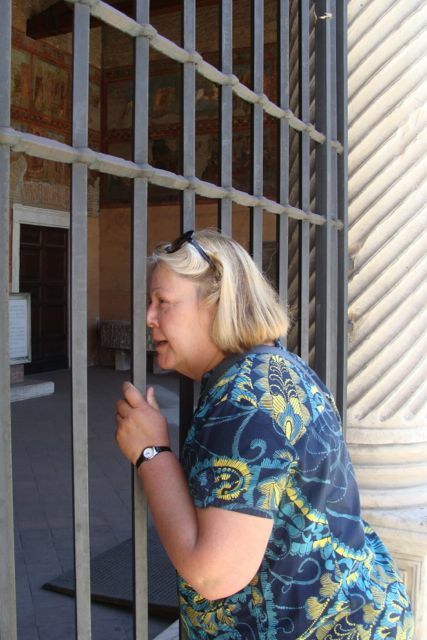 Probably not there, but I did get to peek into a lovely little church - gated but one could still see in. 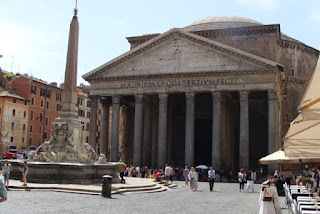 Now I make my way to the Pantheon. The whole of the thing, the piazza, the obelisk, and the ancient building are just wonderful. It is crowded beyond belief, but I enjoy the energy inside, and out. 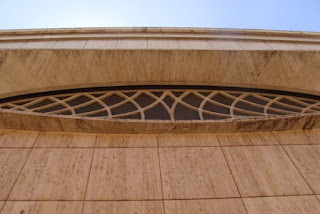 I take some time to look at the back of the building, where some of the marble facing still adheres to the Roman brick. Such glimpses of the past are wonderful to me. Just in back and to the side is Santa Maria Sopra Minerva, a rare gothic church in Rome, and home of the remains of Catherine of Sienna. She didn't appear to be in this particular morning - I did look for her. What astounded me, is how the Romans have begun to clear certain areas of automobiles. It used to be that the piazza in front of the church, with its elephant supporting an obelisk was nothing more than a car park. Now it is clean. After the church, I go over to Barbiconi, haberdasher to the pope and other clerics. This morning they need to be a haberdasher to me. We were supposed to bring a white stole for the conference, and I left mine behind. So, where better to find one. My late friend Gerry Coletti brought me cardinal red stockings that he had purchased for me there - so there's a bit of continuity. It was the only such store that I could think of. Naturally, as I made my way back to the hotel, I discovered more than four more. These however were kitschier, with sparkling renditions of Murillo madonnas and such. There is a bad trend among the Romans and what they choose to wear on a Sunday morning. It's not good. It is very hot today, and everyone is dressed down, but not Michael. 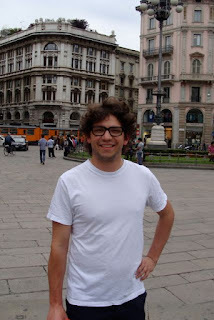 The long sleeves soon prove to be oppressive, so I duck into Santo Adrea della Valle, and cool down. It is calm and quiet, and I take some time to think and ponder. Once that is accomplished, I'm on my way. On my way back I photograph the giant basins that form the fountains at the Farnese Palace. 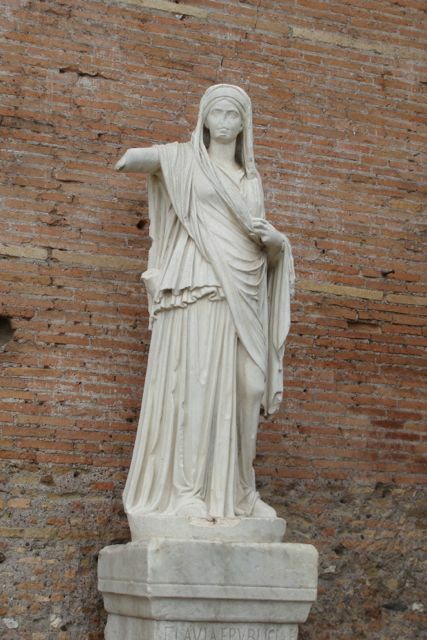 They originally stood in the Baths of Caracalla, but were moved here in the Renaissance. I thought that you'd want to know. While looking for a restaurant, I find this little jewel of a church, all decked out for a wedding with paper roses. It is dedicated to Santa Barbara, and is quite charming. I do find my restaurant, right next to my hotel, Doms Ester. I sit outside and have a first of bruschetta alla pomodoro. Arthur will be happy with another serving of fruits and vegetables. What follows is really good - a risotto alla creme scampi. It is a risotto, supposedly with shrimps, but I am served a wonderful pink rice, flavored by the tomatoes and whole langoustine. It is very good. And it is still very hot. I go to my room. It is time for a siesta. This material was written for the Trinity Church Book Club, of which I am a member. It is some introductory material for the current novel that the club is reading. 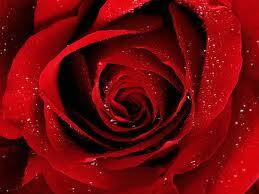 The Name of the Rose was Umberto Eco's first novel, and published in an English translation in the early 80's. It led me on a journey with this eminent semiologiest, leading me to other novels such as The Mysterious Flame of Queen Loane, essays on beauty and literature, a nice little volume filled with advice to authors, and other wonderful works. As a semiologist he fills his work with layer upon layer of meaning and connection. The connections are both actual and virtual or imagined. 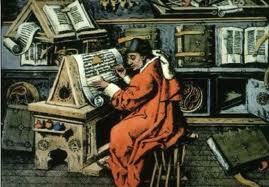 A palimpsest was a piece of parchment or vellum which had an original text erased and another written over it. Often, with care, one could detect the text beneath. This is a good example of his work, text above text, story within story. 1. The whole culture and life of a 14th Century monastery and its scriptorium. Here I am indebted to Stephen Greenblatt's wonderful new book, The Swerve, How the World became Modern. 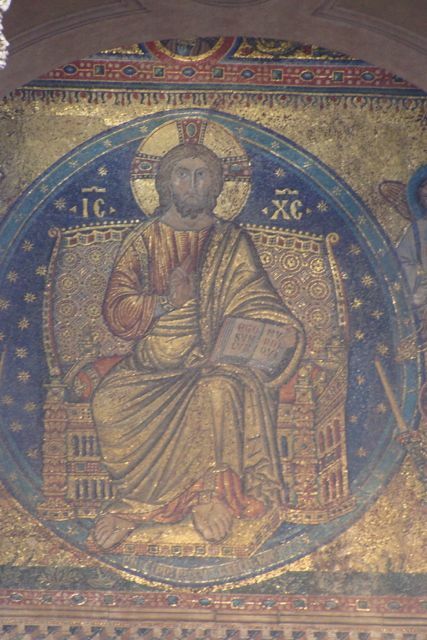 His initial chapters on the medieval search for the ancient is quite enlightening. In a Benedictine Monastery, one was required to read, some were required to serve as scribes, and others ploughed the fields of the community. The requirement to read however was betrayed by the other requirement of silence - one did not discuss what one had read. Thus, contending with dual purposes, the monks were under a great deal of pressure to both possess and dispossess the ancients; hence the conundrum that faces the monks about Aristotle's de Comedia. 2. 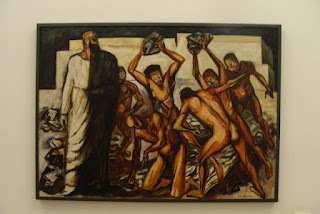 Within this moral dilemma there is another, and that is the dispute between the fanatic Franciscans and the Dominicans on the virtue of poverty in Christian ascetic life. The question, "did Christ own his own clothing" was a simple way of stating the controversy, and the Franciscans thought that he didn't. This period, just on the cusp of the precursors of the Reformation, in Paris (Jean de Gerson) and in Prague (Jan Hus) raised similar questions and concerns. It would consume the age, until it was "resolved" with the Reformation and the Council of Trent. In the novel, however it serves as a reflection of the many moral questions that consume monastic life. 3. Finally, there are all the allusions that Eco makes in all of his writings, that range from the most ancient of things to the most modern of things. Along with a feeling of exaggeration (read: Foucault's Pendulum for example) and just plain inventiveness, one can really be on a search into other literature and history when reading Eco. 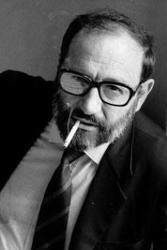 In this regard, he is similar to both Saramago and Bolaño, making constant reference to tangential or related materials. For me, reading Eco is always an education. I hope that this brief but insufficient introduction will help guide your discussion. I'm sorry that I will not be there. Rome, does have its mysteries too, and it is to these that I am directing myself. I have reservations on a train to Milano at 7:00 in the morning, so I get up early, take a shower, and suddenly realize it is only 4:30 in the morning, not 5:30 - so back to bed. I walk to Statione Terminii walking past the Ara Sacra at Argentino, past a bunch of other sites that I would normally stop to take in. I get to the terminal, and board my train - quite comfortable. I settle in at Carriage 4, Seat 56. It is here that I get to experience something quite unique, for a people watcher. A young Italian man is seated across from me - shaved head, one day growth of beard, dark glasses, jeans, white shirt and tie - huge watch with at least five different dials. He is reading, no, he is using his phone. Another man approaches, same descriptors. There is some dispute about who sits where, but it is most gently disposed of. There is a dance between the two strangers - a calm quiet speech between the two of them. They invade each other's private space in a manner that would set most American straight men on edge, and would be a delight, but completely misunderstood by most American gay men. There is touching, soulful looks, gentle conversation, smiles. When we arrive in Milano they walk off together, part, and then go their separate ways. Bellissimo! 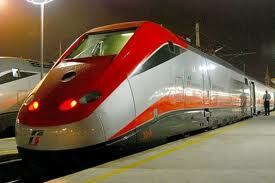 The trip is fast - 3 hours - from Roma to Firenze (no stop) to Bologna, and finally to Milano. Philipp is awaiting me in the concourse between the trains - all smiles. It is so good to see him. I saw him last, with my mother in München in 2004 - so it has been a while. He is excited, his Italian is wonderful and he drives like a maniac. I love it! We go have a coffee at a café that is run by friends, and talk about family, how everyone is - at length. I am interrupted by a phone call from Anna. Her grandmother, Esther Koerber, has died. This has been expected but I know that Anna is devastated. Philipp has arranged for lunch at an unusual place. He quizzes me about it as we walk to it. "What do you think it is like?" "Organized or unorganized?" "Traditional or nontraditional?" I am intrigued. 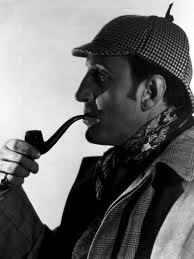 Once we arrive I understand his query. It appears to be a delicatessen but with a few tables. The offerings, or products are very unusual meats and cheeses. There is no menu. We are served specialties. He starts us off with a plate of cured beef, cut carpacio-like with a round of cheese (ricotta and fresh mozzarella creamed together and served with salt, pepper, and olive oil. Delicious! Then there is an amusé bouche of lardo (fat back cured with rosemary and other herbs) with honey and olive oil. It was delicious. Then there was a plate of cured meats; a lightly cured ham, another form of pork, mortadella, speck, two salumi one which tasted of citrus, coppa, breseola, and a bacon-like cut. My mother, the mother of all carnivores, would have loved this. Then there was a cheese plate, which we were to eat in a distinctive order. First a cow's milk cheese, very mild and soft - it prepared the way. Next was an almost sharp cheddar-like cheese that had been kept with Barolo, a rich, red wine. That was especially good. The next cheese was a hard, parmesan-like cheese that had been wrapped in tobacco. and finally a cheese that had been cured with orzo. All of them were wonderful. Finally there were biscotti with what I thought was vin santo, but was grappa with some kind of moscatto. What an experience. Thank you Don Pippo! We go to Philipp's apartment, but first have a gelato. They fill the cone with hot chocolate (like the Spanish serve with churros) and then two scoops. I had crema bologna, and strachiatella. Delicious. A quick nap for both of us, and then off to the Centro where we walk by the Duomo and through the magnificent galleria. 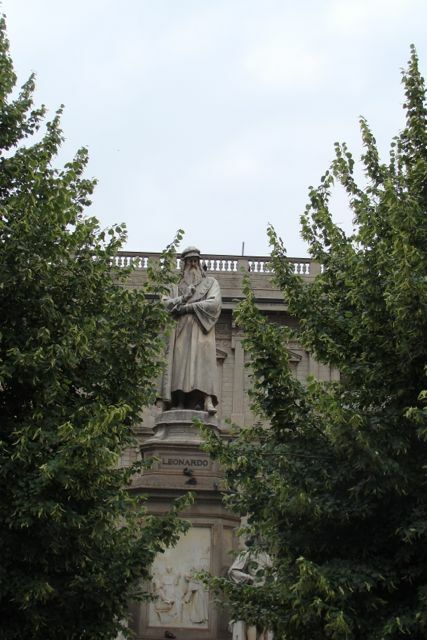 In the piazza across from La Scala, I take a photo of my friend Leondardo da Vinci who presides over the pleasant park-like setting. the last time I was here, it was a bleak paved over area full of cars and a huge television screen, which fascinated me at the time. Philipp takes me to the area where all the fashion houses are, a great place for people watching and window gazing. It's time to go home, but we stop first for a drink, and witness a woman who spends over (I think) €100 on lottery tickets. She doesn't win a thing as we all (Philipp, myself, and the shop owner look on in amazement. Then there is a interesting discussion about addiction. It is time for me to catch my train, so we walk back to the car and Philipp drives to to Centrale, where we say our good-byes. He will wait for a friend who is coming in from Napoli, and I will go back to Rome. I have dinner in the Restaurant on the train, spaghetti pomodoro, pollo con palate, and a macedonia. There's enough time to read and to sleep a bit. I walk back to San Salvatore in Campo, and gratefully crawl into bed. It has been a wonderful day. Thank you so much Philipp!